Your week's been tough, and you may need to pull strength from another source to finish it out. If you buy the "Beth" bootie from Shoe Dazzle (you know, Kim Kardashian's shoe shopping community site), you'll not only channel the inner strength of Breast Cancer survivor, Beth Martinez, but also help in the search for a cure to Breast Cancer. For the month of October, 10% of the sales from this chic faux suede bootie will go to Susan G. Komen for the Cure. Their simple styling and moderate heel make them easy to wear with lots of looks, so their a great work-to-play shoe. At happy hour tonight, an Absolut Bramble or two (or four) will relieve the tensions of the last four days so you can deal with the ones you encounter tomorrow. 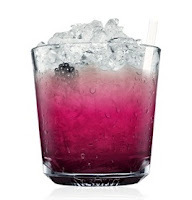 It combines Absolut Vodka, lemon juice, Creme de Mure (French blueberry liqueur), simple syrup and a blackberry garnish. It's sweet, complex and calming. However, as with all drinks, enjoy it in moderation.